the tea conjurer: new gaiwan ... that's already broken. new gaiwan ... that's already broken. I got this lovely red lotus gaiwan, and was thrilled as it was specifically marketed for "people with smaller hands." The issue I have with brewing using a gaiwan is that I have TINY hands. I always burn my fingers and nearly drop the other porcelain one I have because I can't grip it lightly, I have to get a huge hold on it cause my hand will already be stretched around it and compromised. Plus, this gaiwan had the prettest hand-painted design on it and even had a matching tiny translucent teacup that showed the color of the teas off so well. So imagine my dismay when I put the gaiwan down after emptying out the leaves, go to grab a box of cereal, and turn my back for 5 seconds only to hear the most disheartening shatter. I had owned the gaiwan for less than a week, and hearing that sound made my heart drop, especially since Ryan and I are are budgeted and I couldn't just immediately replace something that breaks. I turn around and see the lid shattered on the floor and see that somehow the bowl itself came out unscathed. It was a mix of relief and "well, crap, they don't exactly sell standalone lids, now do they?" I had been having a horrifyingly bad week and ended up sitting in the kitchen chair defeated and crying for an hour while ruminating on all the crappy things I went through. Strangers saying cruel things to me in person, my mother and I having to rescue a small wounded dog hit by a car on a very busy road, and just overall stress. It was rough. The lid breaking was akin to putting the cherry on top of my miserable little cake. 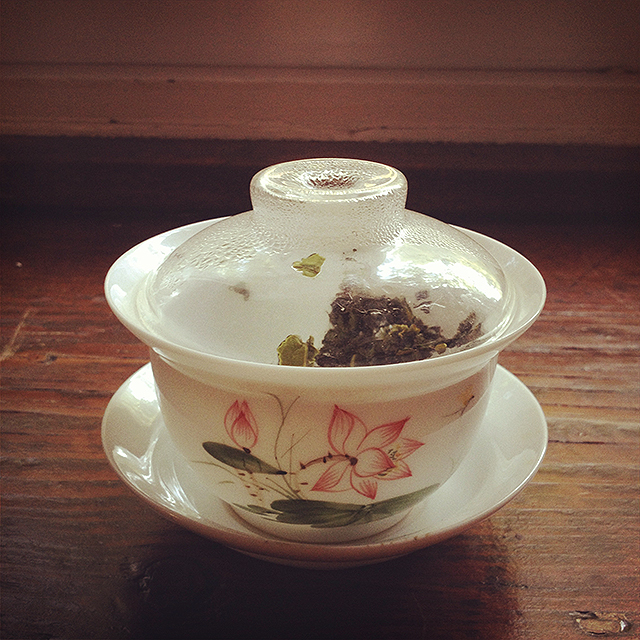 Thankfully, my glass gaiwan, notorious for burning my fingers despite being small, had a lid that was a PERFECT fit. 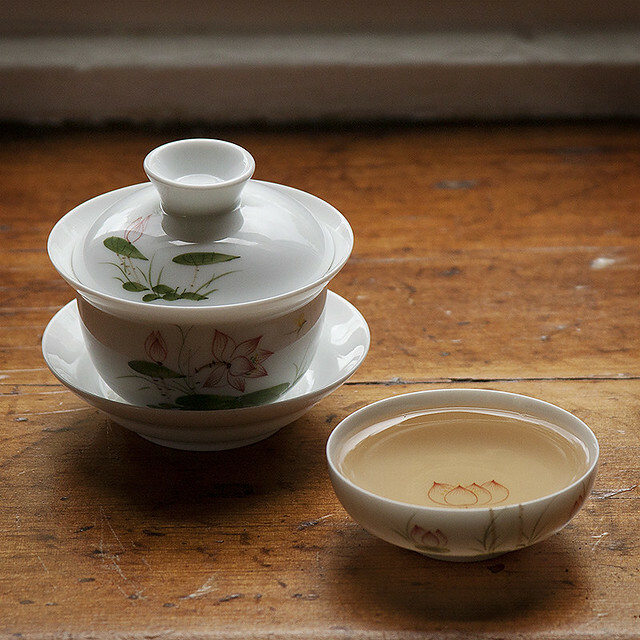 I was able to pop it on top of the red lotus gaiwan and got the best of both worlds: I could watch my tea steep and get the true color of it against the white porcelain too! Aaaand no burning fingers! Aw sugarpie, I'm so sorry. 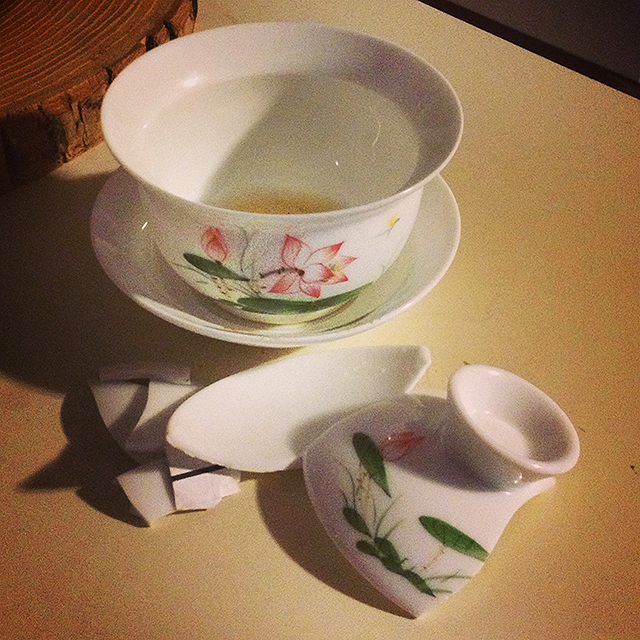 It's always a tragedy when beloved tea ware breaks. I have lost many gaiwan bowls to careless cats, so I feel your pain. It's funny how those little things can sometimes push us over the edge. But honestly, I think that we need to express those stressful, painful feelings - just go whole hog and let them out in a screaming, crying, foot-stomping fit. Then we can move on. And find awesome solutions! Had it been lost to my cat's endearing curiosity I think I'd be less upset, but alas, I had only myself to blame for this break! If it had been a cleaner break I'd try mending it kintsugi-style, but the lid EXPLODED. It's something I keep in my mind for my much more sentimental antique teacups. Mend what's broken and make it more beautiful in the process. Crying for an hour straight was definitely therapeutic mentally, but oh boy, fits like that feel AWFUL afterward. Like a summer cold with achey limbs and all. You may want to contact the company that you bought the gaiwan from and see if they have separates. I think they would be silly not to, knowing people might break one or the other if it's a set. Maybe when you've got a little extra cash to spend look it up. It's great you found a nice fix for it with the glass lid though, whether it be temporary or permanent. I broke a tea cup saucer the very day I got it - for my birthday - from my parents. It was a beautiful teacup and saucer too. But I managed to find the saucer online and ordered it so now I have it again. Sounds like you've had an awful week. I saw your tweets about the dog. :( This ridiculous heat hasn't helped at all. It makes everything feel so much more oppressive. Here's to hoping next week will be better. I'll try contacting the company to see if there are any spare parts, but for now the glass lid is working out fine! Had it been a cleaner break I would have wanted to try kintsugi -- mending broken pottery/porcelain with gold dust & resin. It's something I'm keeping in mind should I (god forbid) break some sentimental antique teaware. I'm so glad the heat & stress is passing. I swear I spent that whole week in a cold bath with a book in hand. :( Stupid retrograde heatwave! "blissful buds" from mellow monk. early spring tieguanyin from verdant tea.